It’s been too long since I posted, but I have been sewing, even if I haven’t been sharing it here. I’ve started on a little wall of quilts in my dining room, opposite my herringbone stenciled wall. Oh, those S’s are HARD! I’m only really pleased with one of them, but I let them ride. I’ve learned that over time, the imperfections in a quilt kind of become endearing to the creator. It’s weird, but mostly true. It’s what you’ll look for, part of how you know it’s yours. It’s good to learn to forgive yourself and move on. 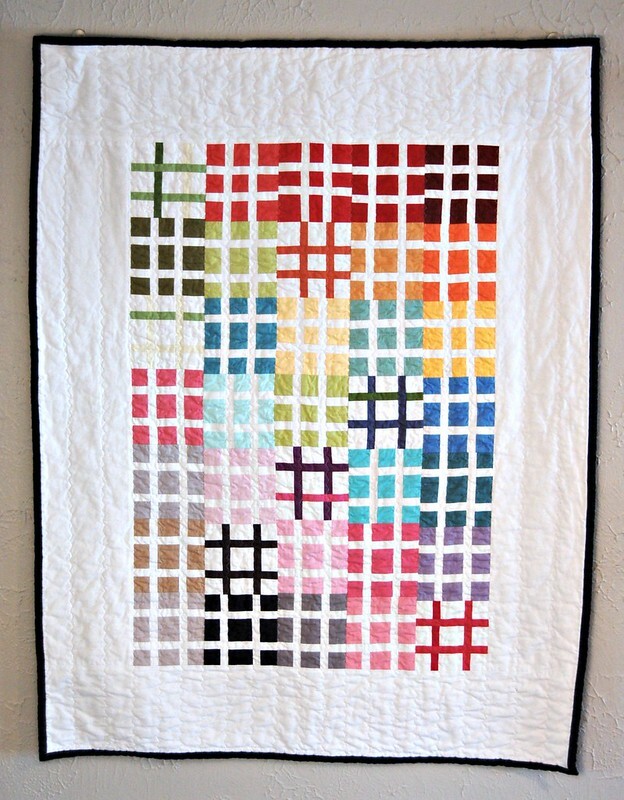 The hashtag quilt was a very simple pattern I found in Fons & Porter’s Scrap Quilts magazine Spring 2014 issue. You can make the top from just a charm pack of solids and less than two yards of white fabric. 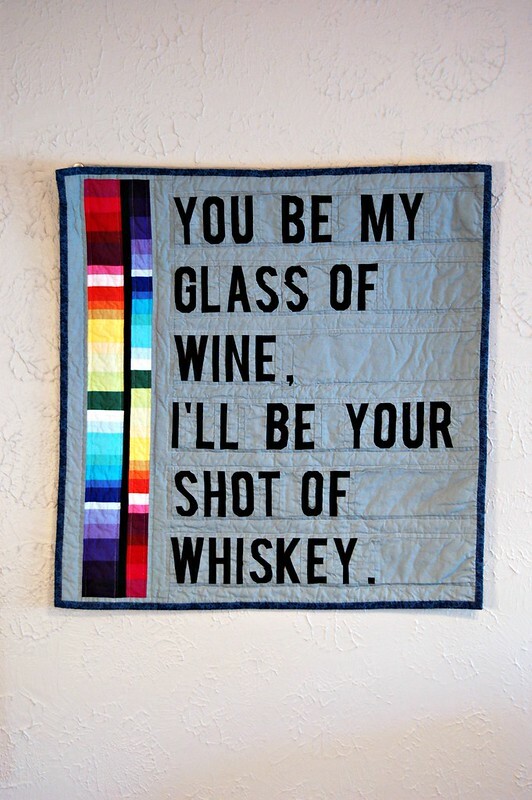 I think this would make a great baby quilt, boy or girl. I have a third little quilt made, but it won’t be hung up until I have a couple more done, just for proper placement. For now I’ll just enjoy these, and the process of making the ones to come! AWESOME !! dang! . . . LOVE that Honey Bee quilt!! What a cool idea! Thanks, and do steal the idea! :D I think it’d be great to size up the letters for a bed or lap quilt. 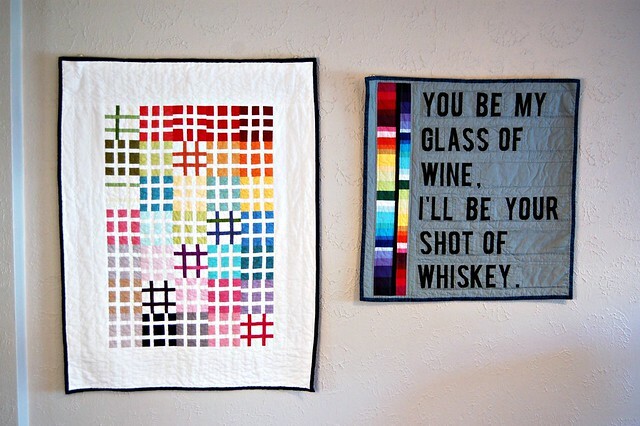 And wouldn’t it be sweet to make a baby quilt with their name? Personalized placemats for the whole family? I’m sure I’ll be making something else with these!